Lakewood community/Tennessee lakefront properties: pictures of Lakewood homes sold or pending!! The top picture is the home at 698 Oak Ridge that just closed last week. This home sold for $168,000 but was worth quite a bit more. 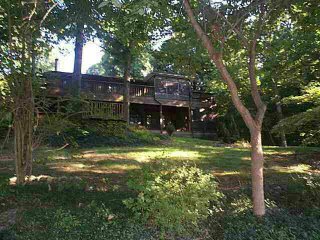 The lake frontage for this home is over 200' and the lot size is 2.3 acres. I do not believe appraisers will give alot of weight to this sale as it sold so "low" in price. The bottom left picture is the house at 60 Juniper Circle. This is the lowest priced home at Lakewood that is currently listed. This home is set to close in 2 weeks. This last home (bottom right) is located at 785 Oak Ridge. This home has alot of water frontage also but needed lots of repairs inside. This home is being purchased by a Florida client who intends to lease this house out for a year or so until she moves here. This home is closing in next 10 days.